While it's true that you can often just add more and more protection in whatever it is you're doing, there comes a point at which you need to ask yourself if maybe the best protection is to reconsider what you're doing in the first place. Thanks to @thegrugq for tweeting this picture of what looks like a full-body condom. 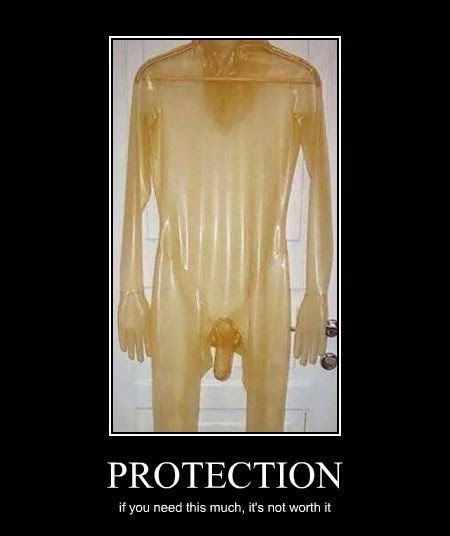 I imagine it's actually some kind of natural coloured latex suit, though I'm not clear on how that's different from a full-body condom. I Can Has Darwin Award? Enough Is Enough, US Government! With Instructions Like These, Who Needs Enemies?